Antique Seth Thomas Adamantine Mantle Clock Made in 1898. Here is another beautiful late 1800's Adamantine clock. 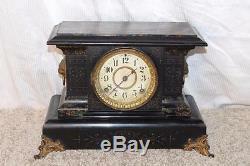 This one was made by the Seth Thomas Clock Co.
USA in November of 1898. This is the actual date of manufacture painted on the bottom of the clock, and not just a patent date. The original signed Seth Thomas movement has been serviced and is in good running and gonging order. Our service includes ultrasonic cleaning and repair of anything that might be found wrong. The "Adamantine" finish, which is a patented laminate finish first used in the late 1800's, is in good shape for its age. You may see a little shrinkage at the corners and edges, some cracking here and there and age staining, as well as minor denting and scuffs, which is the nature of the Adamantine finish. It is a thin laminate designed to simulate either marble or wood and so shrinks, cracks and dents fairly easily with just normal use over time. The green, black and orange Adamantine trim against the jet black Adamantine background was very popular during the late 1800's. The dial and solid brass bezel assembly are original. The brass is tarnished from age and the paper dial, although still very attractive in our opinion, is heavily moisture stained. As stated, it runs well, keeps time and gongs properly. It counts each hour on a mellow sounding antique cathedral gong, i. 1 gong at 1:00, 2 gongs at 2:00, etc. And announces each half hour with a single toll. It measures 16" wide x 11" high x 7 deep. It also comes complete with a key and pendulum. This is a great looking clock to have up on the mantle as well as something you can enjoy while it escalates in value. Show off your items with Auctiva's Listing Templates. The item "Antique Seth Thomas Adamantine Mantle Clock Made in 1898" is in sale since Thursday, December 24, 2015. This item is in the category "Collectibles\Clocks\Antique (Pre-1930)\Shelf, Mantel". The seller is "saved400days" and is located in Port Leyden, New York.